A Mix of Bacteria Protect Against Infections? Author SimaPublished on July 24, 2015 March 29, 2018 Leave a comment on A Mix of Bacteria Protect Against Infections? Like a collection of ragtag villagers fighting off an invading army, the mix of bacteria that live in our guts may band together to keep dangerous infections from taking hold, new research suggests. But some "villages" may succeed better than others at holding off the invasion, because of key differences in the kinds of bacteria that make up their feisty population, the team from the University of Michigan Medical School reports. The researchers even show it may be possible to predict which collections of gut bacteria will resist invasion the best—opening the door to new ways of aiding them in their fight. In a new paper published in the journal mBIO, the team reports the results from tests of seven groups of mice that were given different antibiotics, then were exposed to C-diff spores. The scientists used advanced genetic analysis to determine which bacteria survived the antibiotic challenge, and looked at what factors made it most likely that C-diff would succeed in its invasion.The team also developed a computer model that accurately predicted C-diff's success rate for other mice in the study, based solely on knowing what bacteria the mice had in their natural gut 'village'. The model succeeded 90 percent of the time. Resistance was associated with members of the Porphyromonadaceae, Lachnospiraceae, Lactobacillus, Alistipes, and Turicibacter families of bacteria. 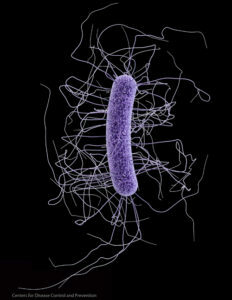 Susceptibility to C. difficile, on the other hand, was associated with loss of these protective species and a rise in Escherichia or Streptococcus bacteria. "It's the community that matters, and antibiotics screw it up," Schloss explains. Being able to use advance genetic tools to detect the DNA of dozens of different bacteria species, and tell how common or rare each one is in a particular gut, made this research possible. Next article:What’s In the “Natural” Flavors In Our Foods?